There was a time when buying a Japanese truck meant getting something small, not well appointed and something that garnered a bit of disdain from some Americans. Back in 2005, Honda introduced the midsize Ridgeline to America. The Japanese company had moved some manufacturing operations to America, and the new offering in the competitive midsize was well received. 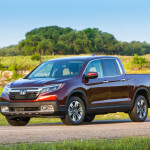 Honda has kept up the pressure since then and its latest generation 2017 Ridgeline, puts even more pressure on the midsize truck market. To be honest I’ve never thought much about Honda trucks. 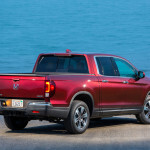 When told I would get a week behind the new Ridgeline, the images of the old small trucks came to mind. The Ridgeline has had a makeover for 2017 and is now manufactured in Lincoln, Alabama. It has a large comfy cabin that’s well laid out and appointed, and has enough power to get just about any job done. 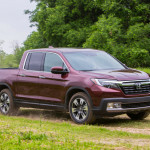 That’s perhaps not the best thing about the new Ridgeline however. The 2017 Ridgeline will seat five, and has a four door, crew cab setup. There are seven total trim levels: RT, RTS, Sport, RTL, RTL-T, RTL-E and the Black Edition The first five can be front-wheel drive or all-wheel drive. The top two are all wheel drive only. The base RT comes nicely equipped with cruise control, AC, push button start, power accessories and a gauge cluster with a 4.2-inch information screen between the gauges. There’s also Bluetooth, a USB port, and a seven speaker sound system controlled by a 5-inch screen all atop 18-inch alloy wheels. The RTS adds body-color door and tailgate handles, keyless entry, remote engine start, tri-zone automatic climate control, foglights and the HomeLink remote system. The Sport mirrors the RTS but adds it has gray-painted alloy wheels, black exterior trim and red interior footwell lighting. The RTL has heated leather front seats, a dropdown driver armrest, and power adjustments for the front seats, eight way for the driver, four way for the passenger. Opt of the all wheel drive and heated outside mirrors and an acoustic windshield are added. The RTL-T adds LED daytime running lights and Honda’s LaneWatch blind-spot camera system. 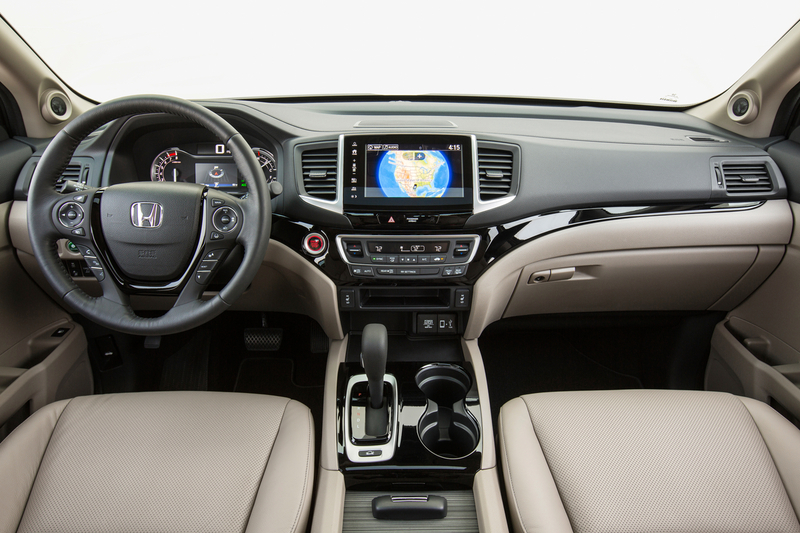 The 5-inch screen moves up to an 8-inch touchscreen, with an audio system that has satellite and HD radio along with navigation. There are also three total USB ports and smartphone integration. The RTL-E has a slew of safety gear including forward collision warning with automated emergency braking, lane departure warning and intervention, adaptive cruise control, and blind spot monitoring with rear cross-traffic alert. There is also a sunroof, driver seat memory, heated seats, the front passenger gets a dropdown armrest, and the rear window is power sliding. The sound system is upgraded and there are LED headlights. At this level the sound system has a unique feature that sends sound to the truck bed. The Black Edition is the RTL-E with black painted accents, wheels, and black leather seats with red trim. 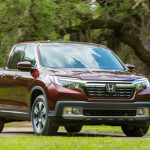 All Ridgelines are powered by a 3.5-liter V6 engine producing 280 horsepower, and 262 pound-feet of torque. 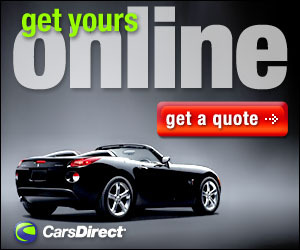 The power is delivered through a six-speed automatic transmission. 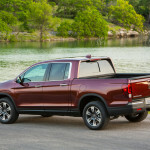 The real uniqueness of the Ridgeline, at least in my humble opinion, is in the back. 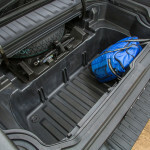 The 64 inch bed is set a little higher than most allowing for a nice lockable cargo box in the floor. Add that aforementioned truck bed audio system that uses six exciters located inside the bed walls in place of conventional speakers, and the optional 400-watt power inverter, and you have the perfect tailgating platform. 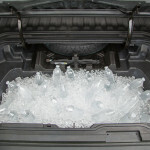 Finally, the cargo box is weather-stripped and has a drain plug making it a nice cooler. 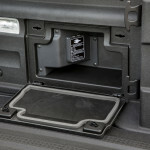 In addition, the tailgate not only drops down like a traditional tailgate, but can be opened like a door with hinges on the side. My tester for the week was the RTL-E.
On the road the Ridgeline drives more like an SUV or even a larger sedan. The ride is smooth, the interior noise minimal and the view nice. There’s enough power to zip past traffic if needed, and haul up to 1584 pounds or tow up to 5000. It might not be the perfect truck for a full time contractor looking for a workhorse. 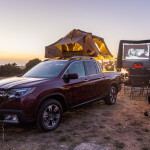 But for someone looking for a truck that can haul, tow and be used to entertain, all while doing the everyday stuff we need our vehicles to do, the Ridgeline is a great choice. 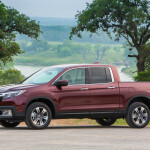 After a week with the new Ridgeline, I was impressed, as was everyone who came in contact with it. 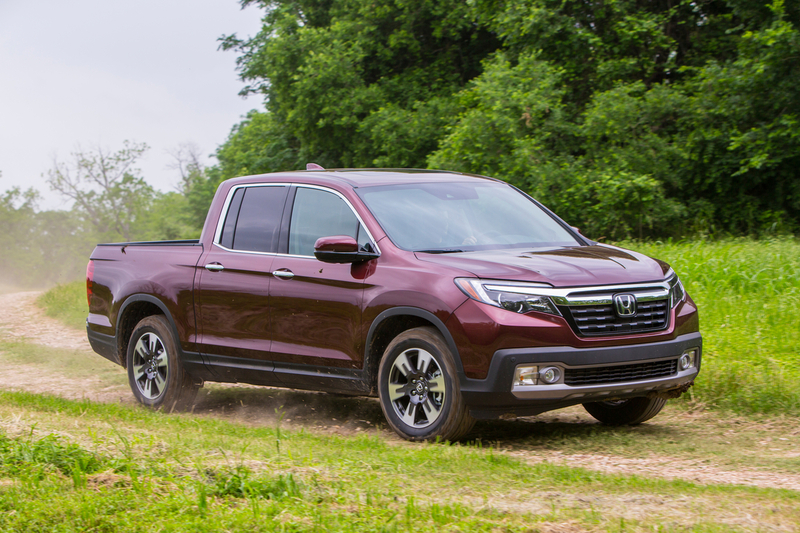 The small unimpressive Japanese trucks are a thing of the past, the Ridgeline proves that. 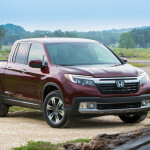 For anyone looking for a midsize truck, the Ridgeline needs to be on your shopping list. Engine: 3.5-liter V-6, 280 hp @6000 rpm, 262 lb-ft torque @4700 rpm.